All orally administered drugs (figure 1) are absorbed in the intestines and enter the liver through the portal circulation. Following passage of the liver, drugs enter the systemic circulation. However, the liver is the major site of metabolic breakdown and as such drugs (and other organic compounds) are subjected to a series of enzyme-catalyzed steps that increase the hydrophilicity of lipophilic compounds, thereby improving their solubility and promoting a rapid excretion. 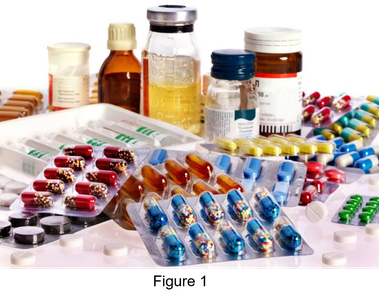 In general, drug metabolism is divided into four phases (0 to 3) (1). In phase 0 the compound is translocated across the cell membrane by specific influx transporters. Subsequently, a reactive intermediate is generated in phase 1 through introduction of a reactive group, while in phase 2 a polar group is attached onto the reactive intermediates of phase 1. Finally, the water-soluble products of phase 1 and 2 are transported out of the cell by efflux transporters. During phase 1 metabolism organic compounds are modified through different (non-synthetic) transformations such as oxidation, reduction, hydrolysis or cyclization. These are performed by a set of enzymes that include flavin-containing monooxygenases, monoamine oxidases, cyclooxygenases, dehydrogenases and cytochrome P450s (P450s) (1). Commonly, these enzymes use molecular oxygen to incorporate an oxygen atom into non-activated hydrocarbons, resulting in conversion of a C-H bond into a C-OH, C=O or C-O-C bond. In general, phase 1 transformations activate organic compounds, allowing further processing in subsequent phase 2 conversions. Typically, these activated metabolites are derivaterized in phase 2 with hydrophilic moieties such as glutathione, sulfate or glycine. These reactions are catalyzed by different transferases and hydrolases, resulting in the detoxification of activated phase 1 metabolites and an increases the overall solubility of the initial organic compounds. The products of phase 2 metabolism are expelled out of the cell by energy-dependent transporters (phase 3) into the systemic circulation and are finally removed by renal excretion (1). Human P450s are crucial phase 1 enzymes as they are responsible for about 75% of the transformations in the drugs metabolism. 57 P450 genes have been identified in humans and five of these are involved in the breakdown of the vast majority of pharmaceuticals (1). More than 17000 P450 genes are currently known. In fact, P450s are ubiquitously present in all domains of life and this strong evolutionary conservation suggests that P450s represent an ancient class of enzymes. Owing to their unique chemistry, P450s take center stage in a variety of biochemical processes, ranging from the degradation of drugs to the biosynthesis of hormones, fatty acids and fat-soluble vitamins. Moreover, impaired P450 functioning in humans is closely linked with different pathologies, such as defects in the metabolism of steroids and vitamin D (2). P450s are heme-containing enzymes with a distinct red-brown color. Due to the presence of a heme b cofactor, these proteins display a characteristic absorption band at 450 nm when reduced with carbon mono-oxide. Accordingly, P450s are named after their defining spectral features instead of their functional properties, which is uncommon for enzymes (3). P450s have been the focus of intense research for several decades because their catalytic activities are of key pharmaceutical and biotechnological importance. Here, I will discuss biochemical and structural features of human and microbial P450s. P450s comprise a large superfamily of heme-containing proteins of which the first members were identified in 1962 in a preparation of liver microsomes (4). These enzymes are named after their characteristic absorption band at 450 nm upon reduction with carbon mono-oxide. Currently, over 18000 P450 genes have been discovered in genomes from organisms from all biological kingdoms, showing that these enzymes are highly conserved and are present in all species (5). Because of this large number of P450 enzymes a systematic way of naming P450s has been devised based on sequence conservation. Specifically, genes encoding P450s are abbreviated with CYP, which is followed by a number corresponding to the family (homologous proteins with more than 40% sequence identity), a letter corresponding to the subfamily (homologous proteins with more than 55% identity) and a number which indicates the gene within the subfamily (6). 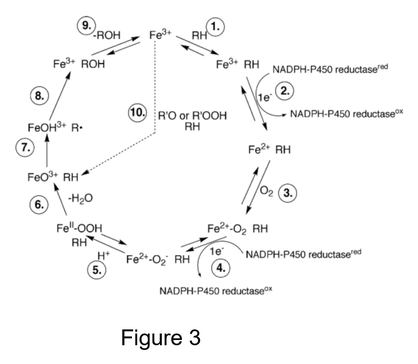 Owing to the unique chemical properties of their heme b cofactor, P450s are able to catalyze an extremely diverse set of redox reactions. These include C-hydroxylation, heteroatom oxygenation, dealkylation and epoxide formation as well as chlorine oxygenation and aromatic dehalogenation (7,8). The general reaction for carbon hydroxylation is shown below with RH as substrate and ROH as hydroxylated product (3). The electrons required for these transformations are provided by different redox partners. Eukaryotic P450s are typically localized to the endoplasmic membrane and rely on another integral membrane protein, cytochrome P450 reductase, for electron transfer. 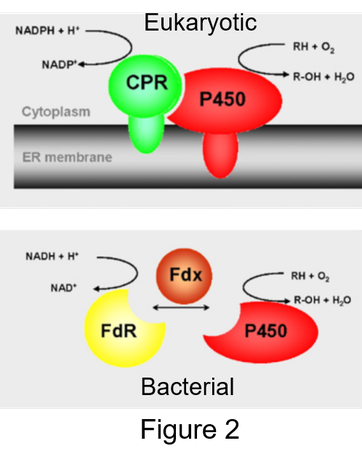 CPR receives electrons through the oxidation of NADPH and these are subsequently passed on to the P450 enzyme. To enable the shuttling of electrons, CPR contains FAD and FMN which both serve as redox cofactor (figure 2, adapted from 9). Bacterial P450s are predominantly found in the cytoplasm and rely on two separate proteins for electron transfer, namely: a FAD-containing reductase and a ferredoxin. The reductase receives electrons via the oxidation of NADPH or NADH, which are handed over to the ferredoxin. This is an iron-sulphur protein that delivers the electrons to the P450 enzyme (figure 2, adapted from 9). Although not phylogenetically related, mitochondrial P450s use a similar two-component system for the transfer of electrons. In this case, however, the P450 is embedded into the mitochondrial inner membrane, while the reductase is peripherally associated with the membrane and the ferredoxin is located into the matrix (9). Interestingly, many variations of P450 enzymes and their redox partners have been discovered. These include P450s fused with their reductase partner on a single polypeptide, representing a self-sufficient P450 system such as P450BM3 from Bacillus megaterium (9). P450s use in general molecular oxygen as cosubstrate to incorporate a single oxygen atom into unactivated hydrocarbon bonds, while the other is reduced to water. This requires scission of the O-O bond and to this end P450s use the catalytic mechanism shown in figure 3 (adopted from 7). The cycle starts with substrate binding (step 1), a first one electron reduction (step 2), oxygen binding (step 3), a second one electron reduction (step 4) and finally a series of steps that are not well understood (step 5-9). These include protonation, cleavage of the O-O bond (compound I), reaction with the substrate and release of the product (7,8). Paradoxically, P450s are able to catalyze the reduction of molecular oxygen without substrate conversion. This unproductive catalysis is known as uncoupling and generally yields hydrogen peroxide or water (10). P450s are monomeric enzymes with a mass ranging between 40 to 55 kDa. Currently, the protein data bank contains 886 protein-based P450 structures of which 423 are ligand bound. In 1987, the first crystal structure of a P450 enzyme was reported, namely: P450cam (P450 101A1) from the soil bacterium Pseudomonas putida at 1.63Å resolution (11). This enzyme catalyzes the hydroxylation of camphor, which represents the first step in the degradation of camphor and enables P. putida to use it for growth and as sole energy source. The structure of substrate-bound P450cam is shown in figure 4 with helices in red, β-sheets in yellow, heme in orange and camphor as blue spheres. The overall structure comprises two domains viz. a large helical-rich domain and a smaller domain predominantly made up of β-sheets. The helical rich domain contains 13 helices (A to L) of which the conserved structural core is formed by helices D, L, I and E (shown in grey, upper left panel). Of particular importance are helices I and L (shown in upper right panel, in magenta and cyan, with the other helices are in grey). The heme (in orange) is sandwiched between these helices. The heme-binding loop (FXXGXRXCXG) that precedes helix L is in red and contains a cysteine (in red). This residue is present in all P450 sequences and serves as fifth heme ligand through a thiolate bond (bottom panel of figure 4 with heme in orange and camphor as blue spheres). This cysteine is, moreover, responsible for the characteristic absorption band at 450 nm and thereby also the name of these enzymes. 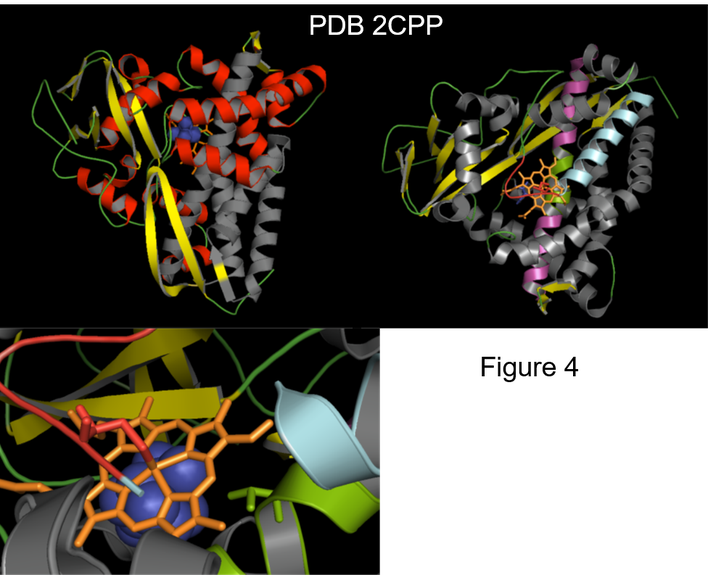 Furthermore, helix I is a core structure of the overall P450 fold because it forms a wall of the substrate binding cavity and contains the conserved oxygen-binding motif (A/GGXD/ETT/S) in green (upper right panel). This motif contains a conserved threonine, which points towards the substrate (bottom panel, in green) and is important for monooxygenase activity probably by facilitating cleavage of the O-O bond (8). Human CYP3A4 is expressed in the liver and the intestines and oxidizes the vast majority of small molecule drugs. In fact, this enzyme displays an unusual broad substrate spectrum as evidenced by its ability to catalyze the hydroxylation of more than 60% of the marketed drugs. In addition to its broad substrate spectrum, CYP3A4 oxidizes many substrates with an exquisite regioselectivity. For example, midazolam, a frequently used sedative and established substrate of CYP3A4 (figure 5, upper left panel), is preferentially hydroxylated at the C1 position. Recently, the structure of CYP3A4 bound to midazolam was determined at 2.7Å (12). This is shown in figure 5 and reveals a characteristic P450 structure comprising a large helical-rich domain and a small domain mainly made up of β sheets as shown in the upper right panel of figure 5. Helices are in grey, while the conserved I and L helices are in magenta and aquamarine, respectively, β sheets are in yellow, heme is orange and midazolam is in blue. A close-up of the region surrounding the heme and substrate is presented in the bottom left panel. Heme is in orange and midazolam is as shown as blue spheres, whereas the conserved cysteine that functions as the fifth (proximal) heme ligand is in red and the catalytically important threonine is in green. As noted above, midazolam is preferentially hydroxylated at the C1 position, although the C4 hydroxylated product has also been observed in particular at high substrate concentrations. The structure of midazolam-bound CYP3A4 offers some insight into the stereoselective oxidation, namely several residues (Ser119, Leu216, Pro218 and Leu482) of the loop between the F and G helices are important for proper substrate orientation. These residues are shown in yellow in the bottom right panel of figure 5. Ser119 (indicated by an asterisks) is, moreover, crucial for the binding of midazolam. Additionally, three hydrophobic active site residues (Phe108, Ile120 and Phe304) ensure stabilization of the 1-OH binding mode. These residues are shown in purple in the right bottom panel, while midazolam is shown in ball and sticks with C1 in red and heme in orange. 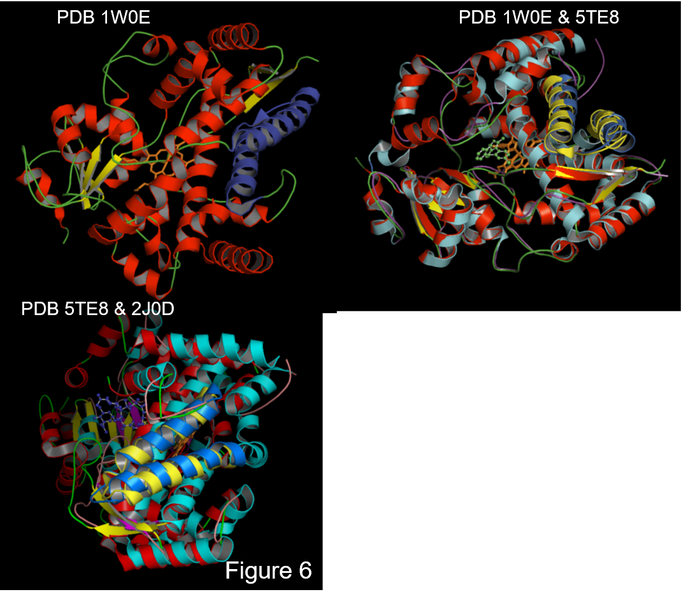 The available structural data revealed important functional differences between P450 enzymes. For example, P450 3A4 has the largest active site found so far with a volume of 1020 Å3 (5). Remarkably, the enzyme is able to accommodate multiple substrate molecules in the active site. In general, P450s are also quite flexible, allowing substrates to enter and products to leave the active site. During catalysis, these enzymes cycle between a substrate-free (open) and substrate-bound (closed) conformation (3). The most flexible parts of P450s involve the helices and loops that define the architecture of the active site such as the F and G helices and the connecting F/G loop (5). Binding of substrates induces frequently conformational changes round the active site, suggesting that substrate binding occurs through an induced fit mechanism. The flexibility of P450 3A4 and the accompanying reshaping of its active site is illustrated in figure 6. The upper left panel shows the structure of the ligand-free (open) structure of P450 3A4 with helices in red, β-sheets in yellow, heme in orange and F/G region in blue (13). A structural comparison of the open structure and the enzyme containing midazolam (closed structure with helices in blue, β-sheets in red, heme in orange and midazolam in green ball and sticks) is provided in the upper right panel with the F/G region in blue (open conformation) and yellow (closed conformation), revealing a close alignment of both structures. This is indicative of little structural rearrangements upon binding of midazolam. A comparison of P450 3A4 bound to the antibiotic erythromycin or the antifungal drug ketoconazole (14) is provided in the bottom panel of figure 6. The helices of the ketoconazole-containing enzyme are in red, β-is sheets in yellow, heme in green and ketoconazole is shown as blue ball and sticks. The F/G region of this structure is depicted in magenta. While for the structure with erythromycin helices are in blue, β-is sheets in magenta, heme in orange and erythromycin as shown as yellow ball and sticks. The F/G region of the erythromycin-bound enzyme is in grey. Although binding of midazolam (326 Da) has little effect on the overall shape of the enzyme, binding of erythromycin (734 Da) and ketoconazole (531 Da) induce different conformational changes that primarily involve the F/G region as well as neighboring helices (13). This suggests that reshaping of the active site through conformational changes is a prerequisite for binding of sizable substrates. Hence, owing to its large and flexible active site, CYP3A4 is able to accommodate different-sized substrates, ranging fom 600 Da to 1200 Da, thereby offering a structural explanation for its broad substrate spectrum. P450s are able to catalyze an extremely diverse set of redox reactions. These include C-hydroxylation, heteroatom oxygenation, dealkylation and epoxide formation as well as chlorine oxygenation and aromatic dehalogenation often accompanied with an exquisite regioselectivity (7,8). Because of their unique chemistry, P450s are of considerable interest for biotechnological and pharmaceutical applications (15). However, their full industrial exploitation is hampered by their poor thermostability. Thermophilic microorganisms are an established source for robust enzymes and therefore the discovery of novel thermophilic P450s is of key biotechnological interest. To provide insight into the structural basis of thermostability, P450 231A2 from the archaeon Picrophilus torridus was functionally and structurally characterized (16). P torridus evolved to occupy ecological niches with a temperature of 60 OC and a pH value between 0-2 and as such it represents the most acidophilic organism known. 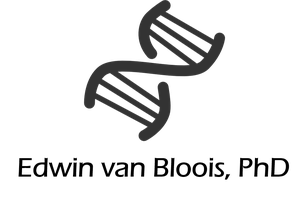 Its genome contains two potential P450 enzymes of which CYP231A2 is unusually small with a size of 352 residues and a mass of 39 kDa. Its structure containing a pseudo-substrate (4-phenylimidazole) was solved at 3.1 Å and is shown in figure 7. Despite its small size, P450 231A2 is folded into a typical P450 structure (left panel) with a large helical-rich domain and a smaller domain mainly comprising β-sheets. 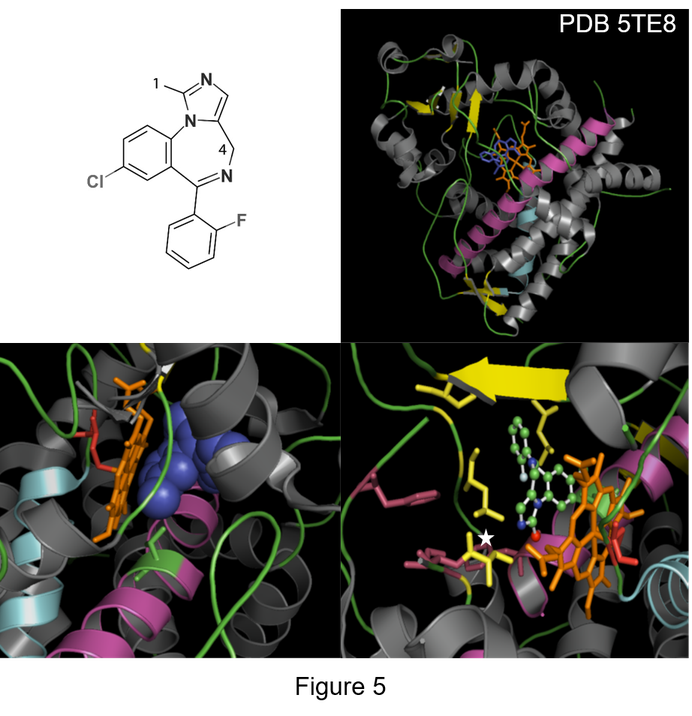 Helices are shown in red, β-sheets in yellow and 4-phenylimidazole is represented as blue ball and sticks. The heme (orange) is sandwiched between the I and L helices (magenta). A close-up of the heme surrounding region is shown in the right panel with the thiolate cysteine as red sticks and the catalytically important threonine as green sticks. The pseudo-substrate is shown as blue ball and sticks and is located between the heme and the conserved threonine. The melting temperature of mesophilic P450cam is 55 OC, while the ligand-bound P450 231A2 complex exhibits a melting temperature of 73 OC. This confirms the thermostable nature of the enzyme and is consistent with the optimal growth temperature of P torridus. (60 OC). Molecular features known to contribute to thermostability, include the presence of an extensive salt-bridge network and an increased number of aromatic residues. Both features are, however, not observed in the structure of P450 231A2, suggesting that its small size and compact structure contribute to increased thermotolerance (16). Cytochrome P450s are a large superfamily of heme-containing enzymes that are ubiquitously present in all cells (5). In humans, P450s are best known for their crucial role as phase 1 enzymes in the catabolism of drugs and other xenobiotics (1), although these enzymes take center stage in wide range of biochemical processes, including the biosynthesis of steroid hormones as well as fatty acid and vitamin D metabolism. Moreover, P450s have been implicated in tumor progression through the activation of procarcinogens. These enzymes have therefore emerged as attractive targets for the development of anticancer drugs (2). Additionally, P450s are present in many microbial genomes, including those of important human pathogens such as Mycobacterium tuberculosis and Candida albicans. This suggests that these enzymes are potential targets for the design of novel antibacterial and antifungal drugs (3). Owing to the unique chemical properties of their heme cofactor, P450s are able to catalyze an extremely diverse set of redox reactions. These include C-hydroxylation, heteroatom oxygenation, dealkylation and epoxide formation as well as chlorine oxygenation and aromatic dehalogenation often accompanied with an exquisite regioselectivity (7,8). The electrons required for these transformations are typically provided by different redox partners. For example, eukaryotic P450s, which are embedded into the endoplasmic membrane, cooperate with cytochrome P450 reductase, another integral membrane protein, for electron transfer. The latter protein contains FAD and FMN as redox cofactors (9). In contrast, bacterial P450s are found as soluble proteins in the cytoplasm and require two separate proteins for electron transfer. These are: an FAD-containing reductase and an iron-sulphur protein called ferredoxin. Interestingly, many variations of P450 enzymes and their redox partners have evolved. These include mitochondrial P450s that use a similar bacteria-like two-component system as well as self-sufficient P450 systems in which the monooxygenase domain is fused with its reductase partners on a single polypeptide (9). The unparalleled chemical features of P450s ensure that these enzymes are pharmaceutically and biotechnologically relevant (15), although their full exploitation is hampered by several factors, including their poor stability, need for redox partners and high degree of uncoupling. Archeal extremophiles are an established source of robust enzymes and the discovery of thermostable P450s from these organisms is a crucial step towards their industrial application. The need for additional redox partners for efficient electron transfer complicates matters further and in many cases the cognate redox partners of a given a P450 enzyme are not known. It is therefore not surprising that self-sufficient P450 systems, such as P450BM3 from B. megaterium, have grown in popularity. Despite their unique chemistry, the catalytic efficiency of P450s is highly sensitive and under suboptimal conditions a high degree of uncoupling - reduction of molecular oxygen without substrate conversion - has been reported. This unproductive catalysis generally yields hydrogen peroxide which ultimately inactivates the enzyme. Protein engineering is successfully used to improve the catalytic efficiency of P450s (17). 1. Stanley LA 2017. Drug metabolism in Pharmacognosy (pp 527-545). Academic Press, Elsevier. 2. Nebert DW, Wikvall K, Miller WL. 2013. Human cytochromes P450 in health and disease. Philos Trans R Soc Lond B Biol Sci. 368 (1612). 3. Guengerich FP, Waterman MR, Egli M. 2016. Recent Structural Insights into Cytochrome P450 Function. Trends Pharmacol. 37: 625-640. 4. Omura T, Sato R. 1962. A new cytochrome in liver microsomes. J Biol Chem. 237:1375-6. 5. Poulos TL. 2014. Heme enzyme structure and function. Chem Rev. 114: 3919-362. 6. AJ Paine. 1991. The cytochrome P450 gene superfamily. Int J Exp Pathol. 72: 349–363. 7. Isin EM, Guengerich FP. 2007. Complex reactions catalyzed by cytochrome P450 enzymes. Biochim Biophys Acta. 1770: 314-3029. 8. Denisov IG, Makris TM, Sligar SG, Schlichting I. 2005. Structure and chemistry of cytochrome P450. Chem Rev. 105: 2253-2277. 9. Hannemann F, Bichet A, Ewen KM, Bernhardt R. 2007. Cytochrome P450 systems--biological variations of electron transport chains. Biochim Biophys Acta. 1770: 330-344. 10. Grinkova YV, Denisov IG, McLean MA, Sligar SG. 2013. Oxidase uncoupling in heme monooxygenases: human cytochrome P450 CYP3A4 in Nanodiscs. Biochem Biophys Res Commun. 430: 1223-1227. 11. Poulos TL, Finzel BC, Howard AJ. 1987. High-resolution crystal structure of cytochrome P450cam. J Mol Biol. 195: 687-700. 12. Sevrioukova IF, Poulos TL. 2017. Structural basis for regiospecific midazolam oxidation by human cytochrome P450 3A4. Proc Natl Acad Sci U S A. 114: 486-491. 13. Williams PA1, Cosme J, Vinkovic DM, Ward A, Angove HC, Day PJ, Vonrhein C, Tickle IJ, Jhoti H. 2004. Crystal structures of human cytochrome P450 3A4 bound to metyrapone and progesterone. Science. 305: 683-686. 14. Ekroos M, Sjögren T. 2006. Structural basis for ligand promiscuity in cytochrome P450 3A4. Proc Natl Acad Sci U S A. 103: 13682-13687. 16. Ho WW, Li H, Nishida CR, de Montellano PR, Poulos TL. 2008. Crystal structure and properties of CYP231A2 from the thermoacidophilic archaeon Picrophilus torridus. Biochemistry. 47: 2071-2079. 17. Kumar S. 2010. Engineering cytochrome P450 biocatalysts for biotechnology, medicine and bioremediation. Expert Opin Drug Metab Toxicol. 6: 115-131.